No matter what industry you operate in, safe height access challenges are not always solved by off the shelf solutions. The shape, dimensions and height of workshop infrastructure, buildings and machinery can vary drastically from site to site. Bu these sites still have the need to carry out the work safely, efficiently and with compliance in mind. 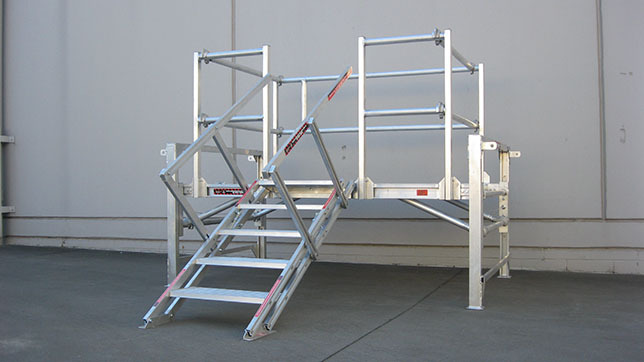 This is SafeSmart Access' domain – for decades, we have been at the forefront of creating portable height access solutions, from cantilever stairs to aluminum work platforms to specialist vehicle access and more. We are strategically based in Los Angeles, Cleveland and New York, so no matter where you are in America, we can assess your challenges onsite, design a unique solution, build it to the highest quality OSHA-approved standards and deliver it to you. Get in touch now with your access requirements and the get the solution rolling today. SafeSmart's in-house team of designers and tradespeople have many years of experience in drafting and manufacturing custom solutions for any industry. In aviation, construction, mining, manufacturing, transport and logistics and defense, we have created compliant one-off products that help contractors work safely at height. So whether you need access to vehicles, personnel carriers, ships, aircraft or in maintenance facilities, SafeSmart Access understand your specific industry's needs. And upon commissioning, we will provide you with a three-dimensional, interactive drawing, so you know that what we have in progress is exactly what you need. It's all part of our six-step process that ensures absolute satisfaction every time. The result? Increased productivity and safety. SafeSmart Access have helped hundreds of large businesses gain added productivity through solutions that feature the ultimate in maneuverability and customized access that helps a contractor get the job done as close to the structure as possible. We'll Make It Happen> If you have any enquiries about any of our customized steel or aluminum work platforms, stairs, ladders and more, get in touch with us today.